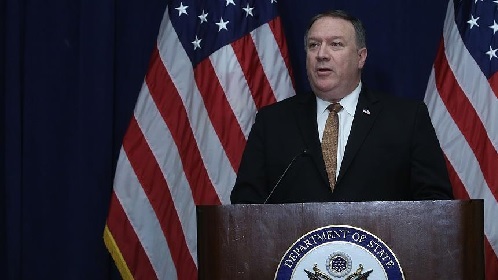 US Secretary of State Mike Pompeo sought to reassure Iraqi officials on Wednesday that Washington remained committed to fighting the Daesh group, as he tours regional allies troubled by US plans to withdraw from Syria. Pompeo’s unannounced visit comes less than two weeks after President Donald Trump drew criticism for failing to meet a single Iraqi official during a surprise Christmas trip to US troops at an air base in western Iraq. The US top diplomat is in the Middle East to urge allies to continue to confront the “significant threats” posed by Iran and extremists despite Trump’s shock decision last month to pull all US troops from Syria. In Baghdad, Pompeo met a raft of senior officials including Prime Minister Adel Abdel Mahdi and President Barham Saleh. He underlined “US support for the new Iraqi government’s efforts to deliver stability, security and prosperity to all Iraqis,” a US official said. He ducked reporters’ shouted questions about US pullout plans, but Saleh replied that Baghdad wanted Washington to remain engaged. “We will need the support of the US,” he said, expressing “gratitude to the US for support over the years”. “Daesh is defeated militarily, but (the) mission is not accomplished,” Saleh added.